At Shadyside Presbyterian Church, we are eager for children to learn that the church is a special place for them, where they belong, are loved, have friends, and find important service to do. 9:30 a.m. Year-round child care for infants through 3-year-olds is offered through the end of worship. Parents should bring their infants and toddlers to the Sunday Nursery. 9:45 a.m. Sunday school classes are preceded by a brief time of fellowship at 9:30 a.m. and are offered for 4-year-olds through adults September to May. 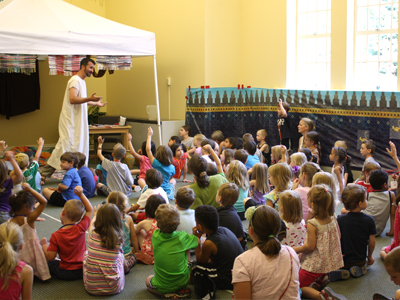 A storytelling circle is also offered for 2- and 3-year-olds during 11 a.m. worship September to May. 11:00 a.m. Worship (year-round): The Sunday Nursery remains open for infants and toddlers. Families with 2- and 3-year-olds may report directly to the Jericho Room for storytelling circle. Four-year-olds through second-graders are encouraged to worship with their families and may exit with their teachers before the sermon to participate in children’s chapel, followed by activities in their regular classrooms. (Children are always welcome to remain in worship with their parents. Any parent who would like to accompany a child to children’s worship activities is always welcome to do so. In fact, we request that first-time guests accompany their child to the Chapel; afterward, you may return to the Sanctuary.) A cry room with a video broadcast of worship is available in the Craig Room (accessible through the Narthex at the back of the Sanctuary). During the school year, junior and senior high students have their own gatherings coordinated by Shadyside Presbyterian Church’s Youth Ministry at 9:30 a.m. Many volunteer as classroom aides during the worship hour. Interested teens should contact Ellen Allston to apply to become classroom aides. One of the wonderful – and most challenging – things about Sunday school is that we always need more teachers! It’s wonderful because there is room for you – please don’t sit back and think that Shadyside is such a great congregation that, surely, we already have enough Sunday school teachers. Visit this page to learn more about becoming a Sunday school leader, and make the decision to join us! Shadyside Presbyterian Church publishes a children’s worship bulletin to welcome all children to the sanctuary each week. It includes worship aides, information, and puzzles. Please read and enjoy this bulletin with your children and the other children in your pew.